I am SO excited to talk to you about ella+mila today! I was so incredibly lucky to receive their product for review. I had seen it swatched before but I had no idea the quality would be so good! This brand was named after a set of twin sisters. How cute is that? 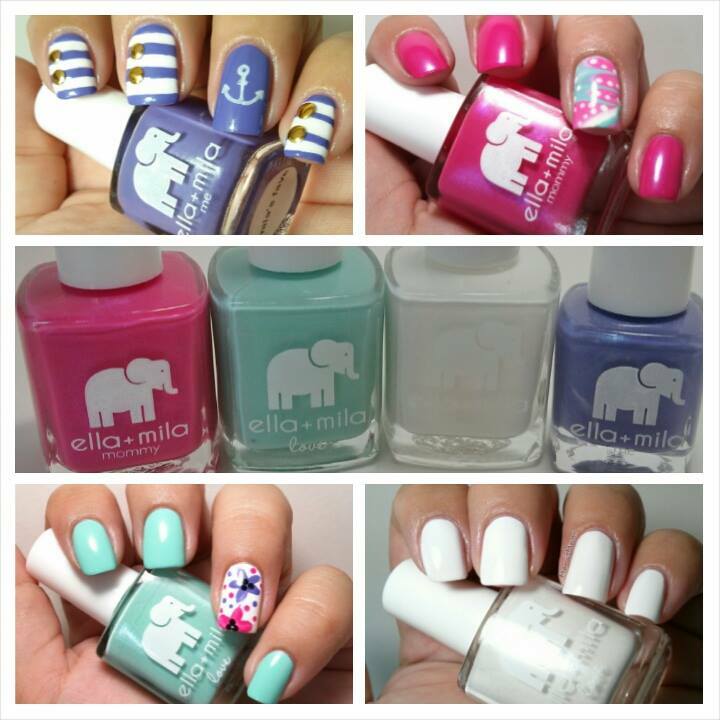 This is also the reason why this brand has the adorable “mommy + me” polishes. These pretties are 5 free and cruelty free (they are even PeTA certified) which makes tiny (and not so tiny) manicures so much safer! Also, they have the most adorable gift sets! Definitely check those out! The variety in colors is wonderful! I was in nail heaven when I saw the four crèmes they sent me; I am a HUGE crème polish lover! These we very flowy, creamy and opaque. Loved them! *First color to jump at me was Cosmo Pink, a beautiful bright pink with a purple hue which reminded me of Orly’s Fabulous Flamingo except the formula here was way better, two coats of this one vs 3 coats I usually need for the Orly. You see 2 coats plus top coat in the pics. I had been wanting to try water marbling forever, as a matter of fact water marbling is one of the reasons why I got into nail art but I have to admit I’ve always been afraid of it because I know that a lot of polishes don’t work well. I completely got a vibe as soon as I saw these babies and said.. Why not? So I prepared for it, I’m kind of sad that I actually did my first wm with these because I’m afraid I might have gotten spoiled… these babies spread SO beautifully. And thanks to them I think I had a pretty good first experience with wm. what do you guys think? *My second mani features Ibiza Breeze, as you might know I have Spain deep within my heart and the name just called to me! This is a beautiful minty green almost powder mint. SO pretty, I love mints and this is definitely up there in my list. The formula as I said was amazing and since Ibiza is an island I wanted to do a mani with fun and vibrant wild flowers. I hope you like it! The pics are 2 coats plus top coat and the darker lit pics are the ones where the polish shows true color. *My third mani was not intentional, it is the manicure I HAD to do while getting ready for my fourth. Why did I have to do it? well because as a nail art aficionado I consider the color white to be absolutely essential. we use it for almost every mani. a good opaque white well it’s not impossible to find, that’s the truth.. I have been using China Glaze’s Snow and Sinful Colors Snow me White for a while.. both really good whites but I wouldn’t consider either of them to be a one coater, also both the formulas can be a bit gloopy. But a good opaque one coater white with a flowy formula?! huh?! YES it is possible! “Pure Love” is it! as a matter of fact I was right in the middle of applying my second coat (out of habit) when I had to stop myself, I didn’t need it! I’m sure you cannot tell which nails are painted with only one coat. I couldn’t! I had to leave them as is and later make them my base for a nail art challenge. 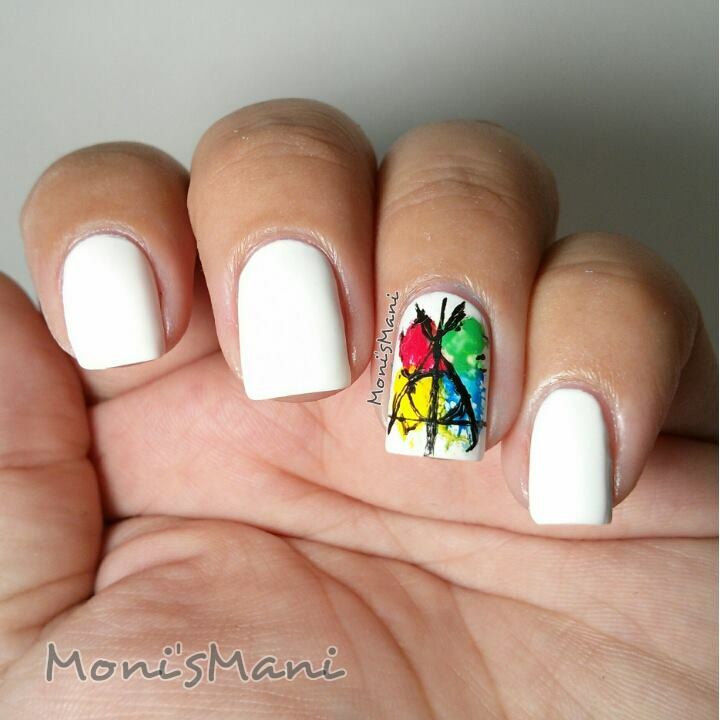 they were the perfect canvas for my Harry Potter Deathly Hollow nails… what do you think? 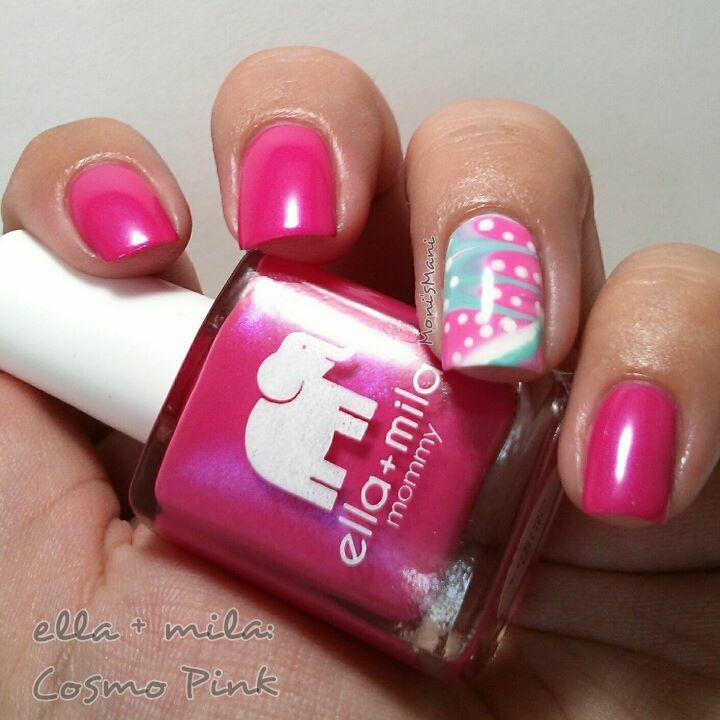 *my last mani for you features Mila’s Fave from the “mommy + me” collection. these mini “me” polishes are so adorable! well this bluish purple is very very pretty. by this time I was already used to and spoiled by the quality so there isn’t much to say about this guy other than you can definitely tell it belongs to the same family. 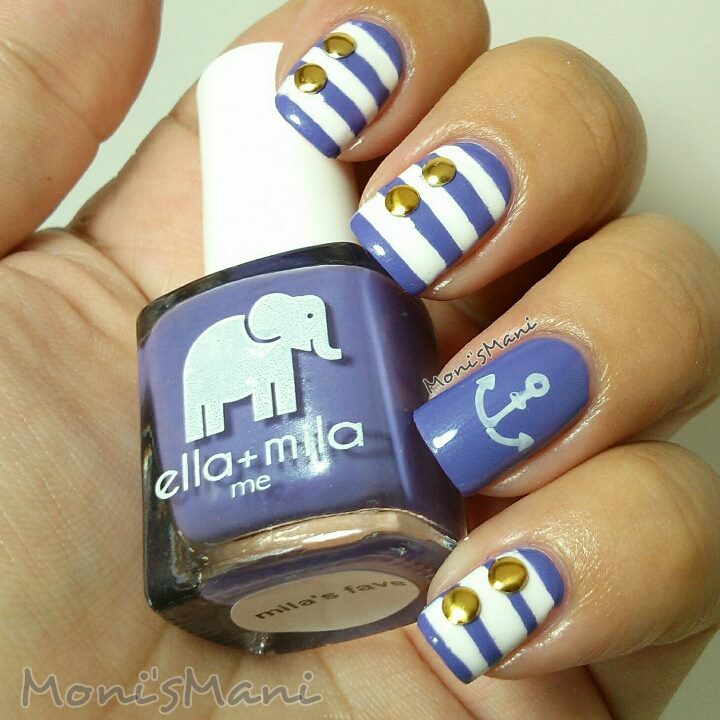 I had been wanting to give nautical another try since I hadn’t done a nautical mani for over a yr and thought this was perfect for it! in the pics you see two coats on the accent finger and one in the others. Hope you like it! Thank you so much to ella+mila for trusting me with your product! you’ve made a fan out of me! I this that the colours are gorge. They have a special…glimmer/shimmer call it as you wish, and I like that. The designes you did are amazing, I especially like the last one.